Diabetic retinopathy is a very common complication of diabetes mellitus. Diabetes mellitus is fast becoming a major health issue worldwide, due to its increasing incidence and to the many health problems that it can cause. In fact, the World Health Organization projects that by 2030, there will be approximately 366 million people with diabetes worldwide. In the United States alone, there are approximately 16 million people with diabetes, and around half have some form of diabetic eye disease, including retinopathy. Nearly 1 million have the advanced form of retinopathy, which may lead to permanent blindness. Not only that, diabetes is the leading cause of new blindness in those aged from 20 to 70, with up to 25,000 new cases of blindness yearly. Globally, diabetic retinopathy has now become the fifth commonest cause of blindness worldwide. Left: normal vision. Right: how your vision may be affected if you have diabetic retinopathy. WHAT EXACTLY IS DIABETIC RETINOPATHY? Diabetic retinopathy is the term used to describe changes in the retina due to the microvascular changes seen in diabetes. The retina is the innermost layer of the eye which converts the light into biochemical signals which are subsequently transmitted to the brain. In diabetes mellitus, the body is unable to metabolize sugar in the body. The high blood sugar levels cause microvascular changes, where tiny blood vessels that either become blocked or leaky. The tiny blood vessels that distribute blood and oxygen to the eye can also be affected. The result in the retina is leakage of fluid and protein, bleeding and retinal detachment if not managed properly. These are some of the typical clinical features seen in diabetes-related retinopathy through a dilated pupil: abnormal new blood vessels, microaneurysms, hemorrhages and hard exudate. 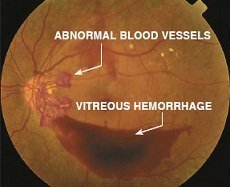 The presence of the abnormal new blood vessels indicates severe retinopathy and an increased risk of sight loss. The extent of these changes determines the type of diabetic retinopathy that you have. Nearly half of type 1 diabetics and a quarter of type 2 diabetics develop some sort of diabetic retinopathy. However, not everyone who has diabetes develops diabetic eye problems. Even if you do, you will most likely have a mild form of retinopathy which may never progress to a sight-threatening condition, provided you keep your diabetes well-controlled. Diabetic visual impairment from occurs mainly due to diabetic maculopathy and proliferative diabetic retinopathy. However, diabetes is also associated with other eye diseases that can also cause blindness. 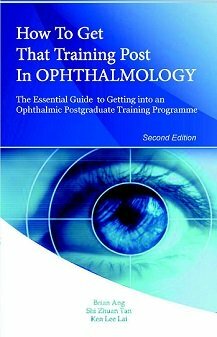 These include cataract, glaucoma and retinal vascular occlusions. WHAT ARE THE MAIN TYPES OF DIABETIC RETINOPATHY? There are 3 main types: non-proliferative diabetic retinopathy, proliferative diabetic retinopathy and diabetic maculopathy. Non-proliferative diabetic retinopathy (NPDR): This is considered the early stage of retinopathy and is the most common seen in diabetics. If you have diabetes, you are likely to develop NPDR at some point in your life, particularly if the diabetes has been present for some time. The tiny blood vessels in your retina are only mildly affected, but may form bulges (microaneurysms) and connections with each other (intraretinal microvascular anomalies) and/or leak fluid (edema), protein deposits (exudates) and blood (hemorrhage). Another typical sign of NPDR is the presence of puffy white patches on the retina (cotton wool spots). These changes can occur anywhere throughout the retina, including the macula. Left: A healthy retina. Right: A retina with non-proliferative diabetic retinopathy. This stage of retinopathy should not cause you any problems. Your vision will remain normal as long as your macula is not affected. You will not be aware of the NPDR in your eye and this is why regular retinal screening eye tests are important. Through retinal screening, your NPDR can be monitored and any signs of progression to more serious stages of retinopathy can be detected early. Proliferative diabetic retinopathy (PDR): This severe form of retinopathy is characterized by the growth of abnormal new blood vessels in the eye. When the diabetes causes the blood vessels to become blocked, parts of your eye and retina develop ischemia as they become starved of oxygen and nutrients. The eye tries to respond by growing a new blood supply to the oxygen starved areas. Unfortunately, fragile new blood vessels that bleed easily are formed instead. This process is called neovascularization. 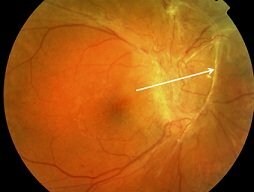 These abnormal new blood vessels grow in the wrong place on the surface of the retina and into the vitreous gel. 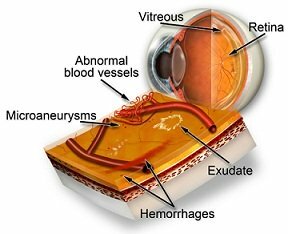 Vitreous hemorrhage occurs when these new blood vessels bleed into the vitreous cavity. The blood blocks light that enters the eye from reaching the retina. The amount of sight loss can be mild to severe, and depends on how much blood is in the eye. Your vision will slowly improve as the hemorrhage gradually clears over several months. These abnormal new vessels also cause the formation of scar tissue (white arrow) which pulls on the retina and may result in tractional retinal detachment. The retinal detachment can affect any part of your retina. If it affects your macula, you will lose your central vision. The only way to treat this is with surgery. Diabetic maculopathy: Diabetic maculopathy is the most common cause of visual loss in diabetes. It occurs when your macula becomes affected by the retinopathy changes caused by diabetes. The macula is located at the center of the retina and is responsible for your central vision and visual acuity. Therefore, if you develop diabetic maculopathy, your central vision and ability to see fine detail will be affected. For instance, you may find it difficult to recognize faces in the distance or to read small print. The amount of sight loss may be mild to severe. However, even in the worst cases, your peripheral (side) vision that allows you to get around at home and outside will remain unaffected. Vision loss from diabetic maculopathy occurs in 2 ways. Diabetic macular edema (DME) is the sweling and thickening of the macula. 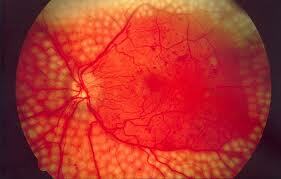 This is due to fluid leakage from the retinal blood vessels in the macula. The vision becomes blurry because the structure and function of the macular photoreceptor cells becomes disrupted. Vision loss from macular edema can be controlled with laser and injections into the eyeball. Macular ischemia occurs when the tiny retinal blood vessels (capillaries) to the macula close up. The vision becomes blurry because the macula does not receive enough blood supply for it to work properly. Unfortunately, there are no effective treatments for macular ischemia. An example of an eye with the typical features of diabetic maculopathy. Macular edema is due leakage of fluid from the retinal blood vessels. 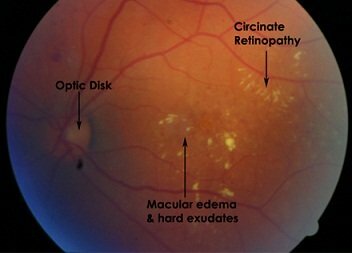 Hard exudates are the yellow-ish deposits seen on the retina. They are caused by leakage of protein material. Good control of diabetes and blood pressure is essential in reducing your risk of sight loss from diabetes. Regular screening eye tests are an important part of any prevention strategy to detect and prevent sight loss from diabetes. The earlier you have treatment, the better the chance of good vision in the long run. If you have diabetes and are pregnant or if you have gestational diabetes mellitus, you will need to have more frequent retinal screening during pregnancy and after your baby is born. Laser is an important therapy modality for sight-threatening diabetic retinopathy. Retinal laser treatment is the first line treatment for diabetic macular edema and proliferative diabetic retinopathy. Laser for macular edema is localized to the macular area. The aim of laser is to seal off any leaking retinal blood vessels and to reduce the swelling of the macula. Laser for proliferative diabetic retinopathy is more extensive. The aim is to burn the ischemic retinal cells in the retinal periphery to stop them from producing chemicals that stimulate the growth of the abnormal new blood vessels. This type of laser is performed when the abnormal new blood vessels are detected. This picture shows the typical appearance of an eye that has had very extensive peripheral retinal laser for proliferative diabetic retinopathy. The yellow spots indicate the areas that have been treated with laser. Intravitreal injections are the injections of medications into the vitreous cavity of the eyeball. Intravitreal injections with steroid or anti-VEGF agents are relatively new but have been very successful in treating diabetic macular edema. However, you may require repeated injections because the effect of each injection may only last a few months. 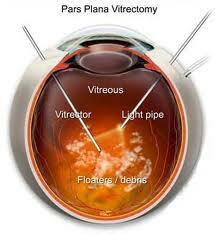 Vitrectomy surgery is reserved for advanced retinopathy where the vision is severely affected. This procedure involves removing the vitreous gel from the vitreous cavity and replacing the gel with a clear solution. The aim of surgery is to remove the blood and scar tissue that has developed within the eye. This is a very specialized and complicated operation and may require you to follow some stringent positioning instructions after surgery.